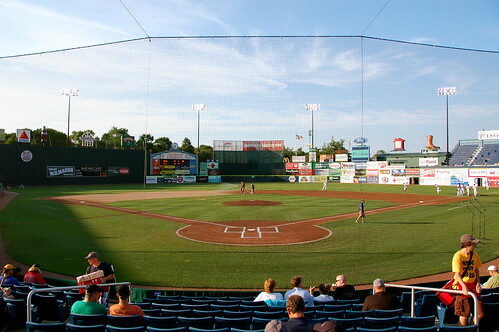 While planning a New England vacation with Nik, I saw that the Binghamton Mets were playing in Portland against the Sea Dogs, the Red Sox AA affiliate. I pretty much made the game be a part of our trip. 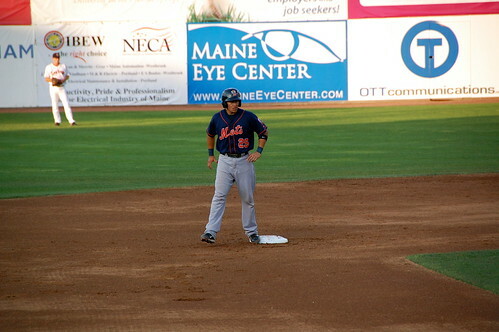 Our seats were something like 8 rows from the field, on the third base side, next to the B-Mets dugout. 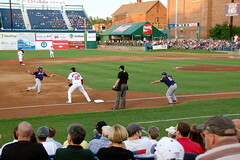 Minor league games are a good time for many reasons, one of which is the chance to roam around various seats and get up, close and personal with the players. 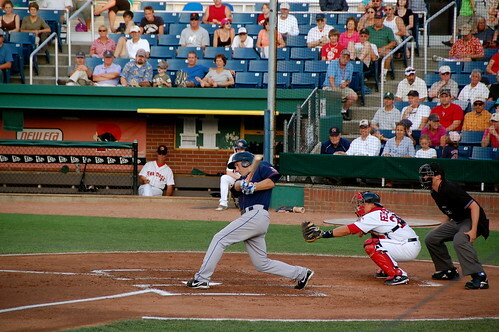 Before the game, it was pointed out to me that J.P. Ricciardi was sitting in a seat just behind home plate. Nik and I wandered over and we made some small talk and I got a picture with him. He asked where we were from and said to hang in, that good things are coming. 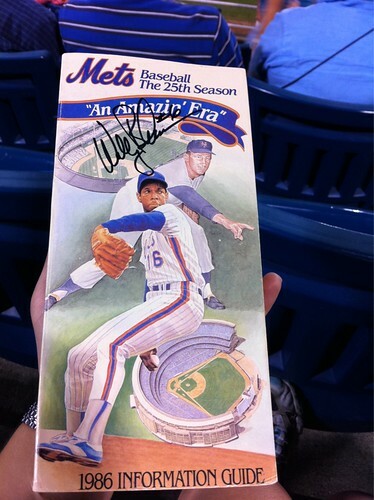 Knowing the easy access to players and coaches, I brought along the 1986 Mets Media Guide Nik had gotten me this past holiday season, in hopes I could get Wally Backman, the current B-Mets manager, to sign it. Sure enough, I was successful, and he was as nice as can be when I asked him for the autograph. 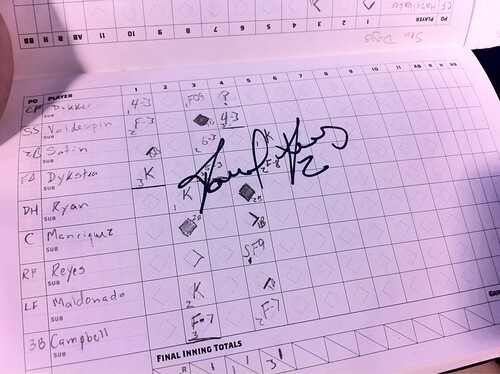 I also got Raul Reyes‘ autograph on our scorecard. We successfully worked around it while keeping score. The game cruised along. Despite not knowing a lot about the players of either team, Nik and I enjoyed the casual vibe and kept score, as we’ve been doing this whole summer. 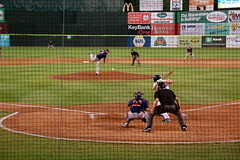 By the bottom of the 9th inning, the B-Mets had a nice 7-2 lead and many of their fans began to leave before the game ended. 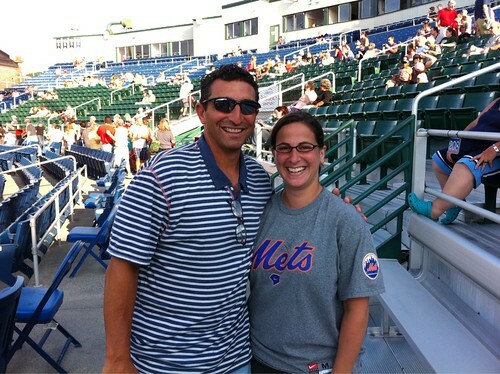 Nik and I decided to move to the first row, just to the side of the B-Mets dugout. Once the game was over, I was taking pictures, rather than asking for autographs. 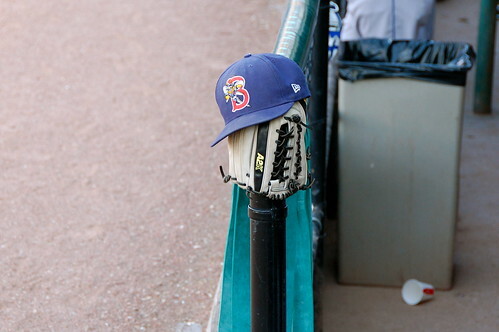 Catcher Salomon Manriquez kept looking at myself and others who gathered at the railing. He brought over a game ball and gave it to one of the kids. 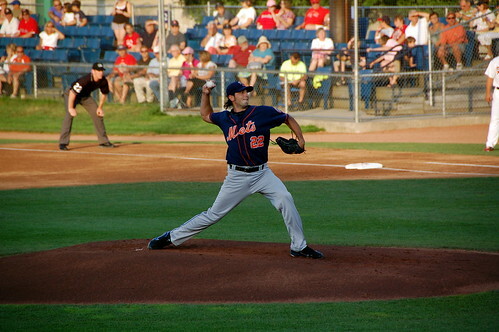 I joked that he was giving it to a Red Sox fan and we both smiled. 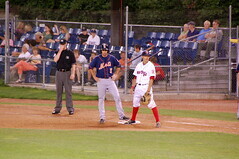 Nik, who was behind me, noticed a broken bat laying out in front of the dugout. 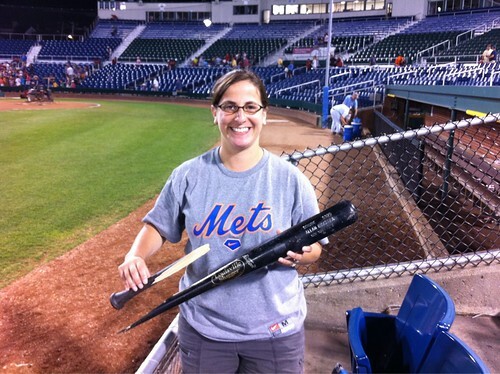 As Manriquez started to walk away, I asked for the bat. He hesitated, went and picked it up and brought it over to me. I was in awe, as if I were a seven-year-old kid. It turned out to be Allan Dykstra’s broken bat that was full of pine tar, broken shards hanging off and even had a little grass stain. It was by far the coolest thing I have ever gotten at a game. That about ended our night at the game. 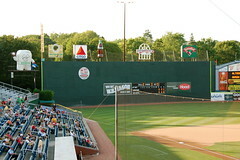 Hadlock Field was pretty nice and has a replica Green Monster wall in left field. One of the ushers started talking with me and couldn’t have been nicer. He also used a faux microphone to sing along with Sweet Caroline late in the game. It was rather amusing.